“When media outlets in many countries cannot afford sending their correspondents to the event, or even perceive it as a distant happening with little relevance to domestic audiences, we saw the potential. The aggregation of local viewpoints helped making the coverage ‘glocal’, in the same way the climate crisis is at once global and local in both its causes and impacts.” Thats how “The Climate News Mosaic” explained its collaborative approach to reporting about UN Climate Change Conferences. The Climate News Mosaic is an independent, non-profit collective of environmental journalists from around the world with reporters based across five continents – from Canada to the Philippines and from Germany to Brazil – producing radio, video and textual stories in nearly ten different languages. The blog they produced together was hosted on nine news websites. “Our 12 days long live blog offered a comprehensive coverage of the climate summit that could not have been otherwise captured in any single story. It featured dispatches from a public presentation on renewable energy strategy in Tel Aviv, from an interview with a senior meteorologist in Potsdam, from a press conference in Rio de Janeiro, from the rescue operations in typhoon hit towns in the Philippines and more. 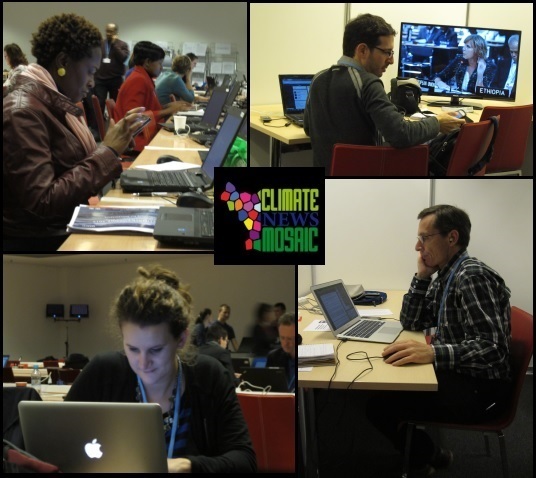 Ultimately, the live blog served to complement, and feed, both the reporting each of the journalists in the group was doing individually and the coverage offered on the different media outlets that hosted it.” The group also published an And perhaps the e-book, featuring nearly 50 stories produced by CNM journalists and published in over 15 publications around the world. Now the grou p is preparing for the UN Climate Change Conference in Paris in summer 2015 for an even upgraded project. We hope the #hostwriterPrize will help to realize this!